5} Decatur Alabama gets lauded next for its fine Big Bob Gibson outfit http://www.foodandwine.com/slideshows/best-bbq-cities/14 I love this place but it’s not in the same league as Archibald’s down in Northport. Without deep and pervasive knowledge of Alabama’s barbecue culture this is an easy mistake to make. That’s the good, the bad and the ugly. You can hardly expect a magazine with the word wine in the title to get it right on barbecue but it certainly could’ve been a lot worse. This article could serve as a nice, beginners guide to smoked meat. 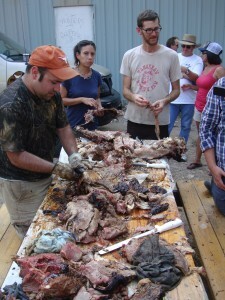 Think of it as barbecue 101 for novices and dabblers. There are plenty of other cities discussed but these were the highlights. What are your favorite barbecue towns in the USA? This entry was posted in Rural Texas, Texas Barbecue and tagged atlanta, barbacoa, barbecue, BBQ, best barbecue, Brisket, brownsville, chicago, dallas, decatur, food and wine, franklin barbecue, kentucky, lockhart, mutton, northport, smitty's barbecue, stanley's, tyler. Bookmark the permalink.